Mix the first four ingredients and refrigerate overnight. The next day, take half the sour cream mixture and mix with the tub of cool whip. Use the sour cream mixture for icing between the layers of the cake. 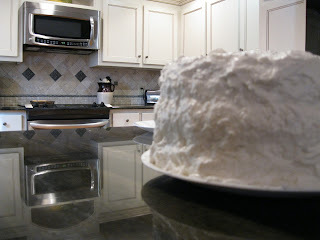 Use the cool whip mixture for icing the tops and the sides of the cake. Keep the finished cake refrigerated! Easy enough?! Tips: Be sure to make the icing the night before and refrigerate overnight. 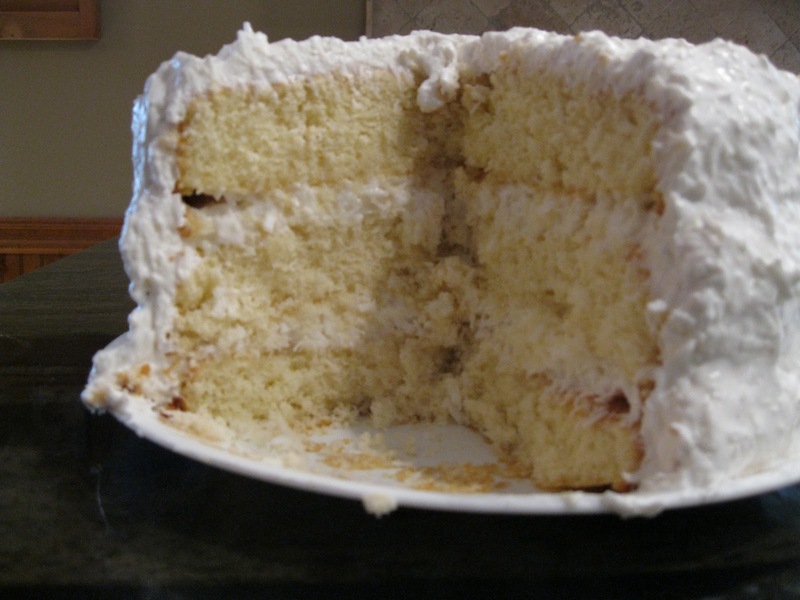 If you drizzle coconut juice/milk on the layers your cake will be more moist. Caution: the longer the cake sits the more moist it gets! DO NOT, repeat DO NOT use dried, flaked coconut. You want to use fresh coconut for this recipe. My great aunt uses two fresh coconuts, I being the lazy smart person I am, use the frozen grated coconut and let someone else do all of the hard work. Granted, I pay more for this, but it is worth the time saved to me. I just let it thaw first and then go about my cake making business. This cake has been a Thanksgiving staple in my family for as long as I can remember. It gets multi-generational seals of approval! You don't suppose aunt Emma gave me the recipe so that I would have to start bringing it to the Thanksgiving dinner do you? I am so going to make this! I have an aunt that makes one for our family gatherings too. I looove me some coconut cake!